Our new crop haylage is now ready to feed and deliveries are flying out the door. 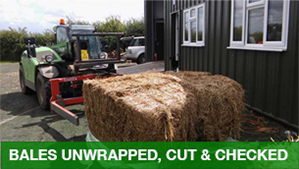 Please see below a short video which we put together last year showing you all about our haylage production. New crop Haylage sampling time! Once the new crop bales have had long enough (at least 8 weeks from wrapping) we check a few before sending any out for delivery. The plastic is removed and the strings are cut, so that we can check all the way through the bale. I love this time of the year-the haylage smells fantastic! Now these bales are ready for delivery, our lorries are super busy! 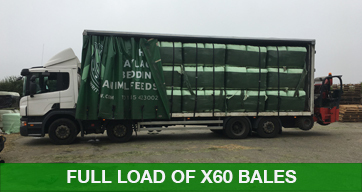 We can fit 60 large haylage bales on a full lorry load. These are then unloaded with our Manitou forklift which has a grab / squeeze attachment to take the bales off the lorry and unload them where you need them. 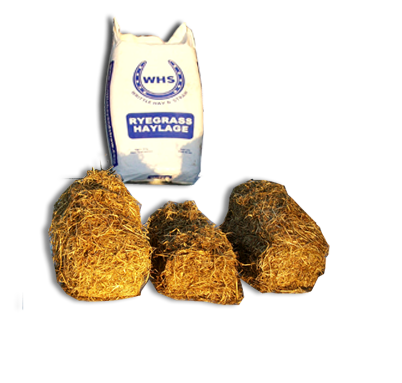 The same top quality haylage you will find in our standard bale haylage original, but now also available in our NEW ‘3 SLICE BALE’. 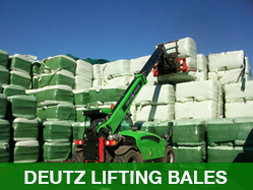 You will find these bales more user friendly and generally easier to use. 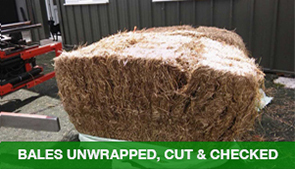 Once you open your bale, you will see 3 clearly defined sections within the bale. This makes filling haynets a much quicker and easier job. As an introductory offer, we are pricing these bales at our usual standard bale haylage original price. We know that consistently high quality feed and haylage is essential to the wellbeing of your horse. We also know that value for money and reliable service is crucial. That’s why we created Writtle Hay and Straw with quality haylage, hay and straw for horses. We understand your life is busy. Now you can shop with us online as well as order over the phone. We are based in Essex but deliver throughout the South East.